Today’s WordPress Daily Prompts: Party Animals? asks: After spending time with a group of people, do you feel energized and ready for anything or do you want to hide in the corner with a good book? I love a good party ’cause I love to talk. I love to talk ’cause then I can get you talking. I love to get you talking ’cause I love listening. I love listening to you ’cause I love having you in my life if only for an hour or two. I love having you in my life ’cause I love hearing about what you are having in your life. I love hearing about your life ’cause I love that you’ll share your adventures with me. I love that you’ll share your adventures with me ’cause I love knowing about you. I love knowing about you ’cause I love finding out what we have in common. I love finding out what we have in common ’cause I love feeling connected with you. I love feeling connected with you ’cause I also love seeing what is different about us. I love seeing how we’re different ’cause I love understanding you my sister and my brother. I love understanding you ’cause that is one of life’s great joys. Understanding is one of life’s great joys ’cause then we can feel kinship and friendship. I love feeling kinship and friendship ’cause that way, whatever we’re doing, it’s going to be a beautiful time. I love having a beautiful time with you ’cause that is my kind of richness. I love that kind of richness ’cause it even makes doing the dishes after the party okay with me. I don’t love doing the dishes though. But it’s okay if you’re there and we’re talking. This entry was posted in Friendship, Life, Love, Uncategorized and tagged dirty dishes, friendship, Life, love, party, understanding by mycookinglifebypatty. Bookmark the permalink. Thanks Janine! 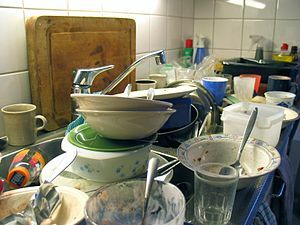 Maybe I should read this post just before doing dishes. My husband sometimes does the drying and we do get to talk then. Whole lot of loves! Nice. Thanks Kathy! That sounds lik a deal! I’ll give you my best linen dish towels.